Las Cruces means the “City of Crosses”. Interestingly enough, you must drive through El Paso, Texas to get there if you are approaching from Carlsbad, NM. El Paso is massive city with military bases and border patrol installations. Several places along this trip we drove through border patrol checkpoints. 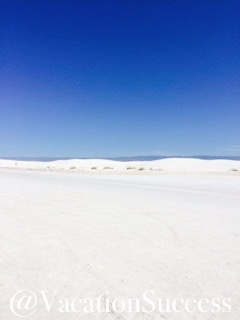 Just north of Las Cruces you will want to see White Sands National Monument. The Sands are just 16 miles southwest of Alamagordo. It is absolutely mind boggling, 640 square miles of gypsum sand. After going through the Visitor’s Center, watch the movie that explains how the Sands came to be. Spoiler Alert: The Sands came to be before California existed! As you drive through the Monument you will feel like you are driving on snowy white roads that have been groomed. You can sled down the hills just as you would on snow. The gypsum always feels cool to the touch even as it sits in the intense sun. An amazing place to visit. La Cruces is a lovely town, home of New Mexico State University. 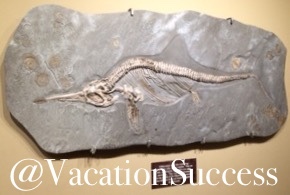 Take time to see the Zuhl Museum at the Visitors Center on the University campus. We were not ready for the mind boggling display of petrified wood, fossilized specimen and natural gems. Don’t miss out on this! The history of the southwest is so rich and can be seen in the old town of Mesilla right in Las Cruces. See St. Albinos Church, now designated as a Minor Basilica. The town square has the usual souvenir shops and art galleries. One gallery was in a real pueblo building, as soon as you walk in you feel the temperature change. Pueblos with 18-24 inch walls keep cool in the summer and warm in the winter, an ancient way to build. Wanting to get out of the heat of the valley heat we headed towards the mountains to the Inn of the Mountain Gods Resort in Mescalero. At 7000 feet in elevation it is a lovely luxury resort with a large casino, spectacular views, several nice restaurants and 18-hole championship golf course. Call 800-545-9011 for reservations. While you are in the mountains check out the small tourist town of Ruidoso. We had dinner at the “Can’t Stop Smoking” BBQ diner. It is quaint and rustic but has amazing BBQ food without preservatives. We ate a multi-meat dinner and bought jerky and sauce to take home!